What was the last thing you ate? Most of us are too busy focusing on other things in our lives to stop and think about the effects drinks and foods we consume have on our teeth. Although the enamel that protects your teeth is the hardest substance in your body, it can still be corroded away by food and drinks. Considering the adult teeth you have are the only set you will ever get, it is a priority to do whatever it takes to make sure they last for your entire life. The truth is, it is not the sugar itself that corrodes the enamel on your teeth, it is the bacteria that feeds on that sugar that produces an acid does the corroding. The acid, which is effectively the waste product from those bacteria burns small holes in the tooth enamel, which leads to tooth decay. A healthy mouth takes about half an hour to neutralise that acid. However, during that half hour, the bacteria are causing damage. Since the bacteria like to feed frequently, if you are snacking on sweets or sipping sugary drinks, there is not enough opportunity for the saliva in your mouth to neutralise the acid in between. It’s equivalent to allowing your teeth to slowly dissolve in acid. Because of the time-scale needed for neutralising the acid, it is better to eat more over a short period of time than it is to spread the eating over a longer period. While the acid from bacteria causes damage to your teeth, so does the acid in acidic drinks. Carbonated drinks – even fizzy water – all contain acid that can cause your teeth to become transparent and sensitive. Drinking these drinks through a straw or with food can help to minimise the damage. Wait at least 30 minutes before brushing your teeth so that you are not brushing in the acid. These tips will help you limit the amount of damage that sugar will do to your teeth. 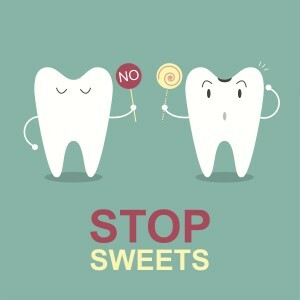 So, take care of your teeth and avoid sugar to ensure you have no long term issues. Are you afraid sugar damaged your teeth? Do you have cavities or do you have any questions ? Make a appointment with Dr Donan, dentist in Fresno CA and we will be happy to help you. Click here if you want to make an appointment with Fresno Dentist.